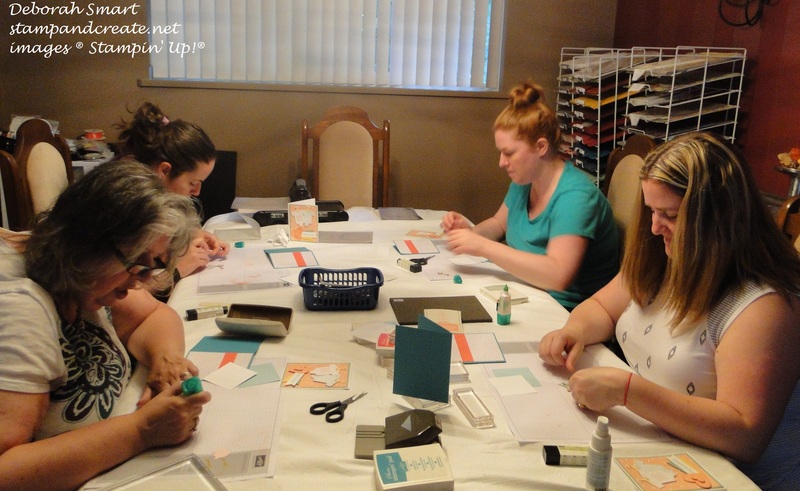 Brides & Babies card class fun! 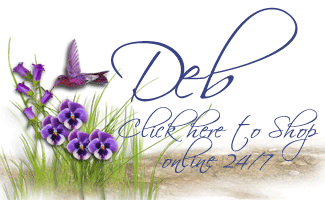 One of my team members, Debbie P. is also a regular at my classes; did you know that I offer all my team members 1/2 price off my classes? I look at it as a learning tool for my team members in how to conduct classes, as well as learning new techniques, honing their stamping skills, and being able to use my designs for their own classes/events. These are some of my wonderful ladies; on the left front is Susan (my BFF of over 30 years – sshhh! we don’t go into specific numbers! ), then Amanda; across from Amanda is Christine, who is Debbie’s sister, and then in the front on the right is my team member Debbie. Is this just too cute, or what?! I wish I could take credit for coming up with this idea, but I have to bow to Pinterest for that! I’ve seen several versions of this baby in a blanket, but I really liked this one, because it uses just the Tree Builder Punch, with the exception of the baby’s head! The blanket is made from the ‘cloud’ shape, the baby feet are 2 of the little ‘raindrop’ shapes; the bow tied on the blanket is the small scallop flower, with 2 of the little ‘raindrop’ shapes tucked behind it. The ‘handle’ for the blanket is one of the tree branches, with the individual branches tucked behind the blanket, and of course then there’s the tree branch itself, holding up the baby. The card base is Bermuda Bay cardstock, with a panel of Cherry on Top DSP, then a strip of Watermelon Wonder cardstock. The punch art baby is layered onto a Whisper White cardstock panel, which is layered on top of a panel of Pool Party cardstock. The sentiment is stamped in Bermuda Bay ink, and the little bird is in Watermelon Wonder ink. I think any new parent would love to receive this card! The other baby card we made using the new Made with Love stamp set, which is the new set that coordinates with the existing Baby’s First Thinlits Dies. This new set is just adorable!! It has a total of 21 stamps in the set; 3 of them coordinate with the Baby’s First Framelits, and 2 with the new Tags & Labels framelits. After all that cuteness, we took a break, then got back to work to on wedding cards. We used the Butterfly Basics stamp set, first stamping the honeycomb image in Crumb Cake ink onto the Very Vanilla oval. 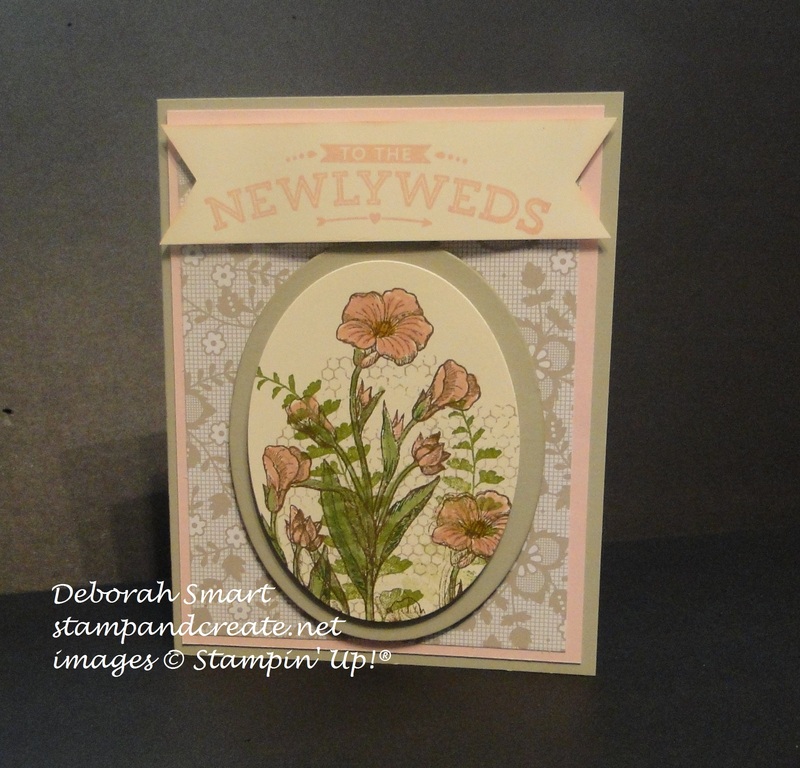 Next, the ferns were stamped in Pear Pizzazz ink, then the flower images were stamped 3 times in Soft Suede ink. I find that stamping in Soft Suede, instead of Memento Black, keeps the image outline soft. The flowers were coloured in using the Blushing Bride Stampin’ Write marker, and the leaves using the Pear Pizzazz marker. The image oval was then layered onto the larger oval of Sahara Sand cardstock; both ovals had been made using the Big Shot and the Ovals Thinlits Dies. The sentiment is from the retired Cheers to Love stamp set; it was inked in Blushing Bride and stamped onto Very Vanilla, and the ends cut using the Banner Triple Punch. It was unanimous at the table that this new Banner Triple Punch is a winner!! 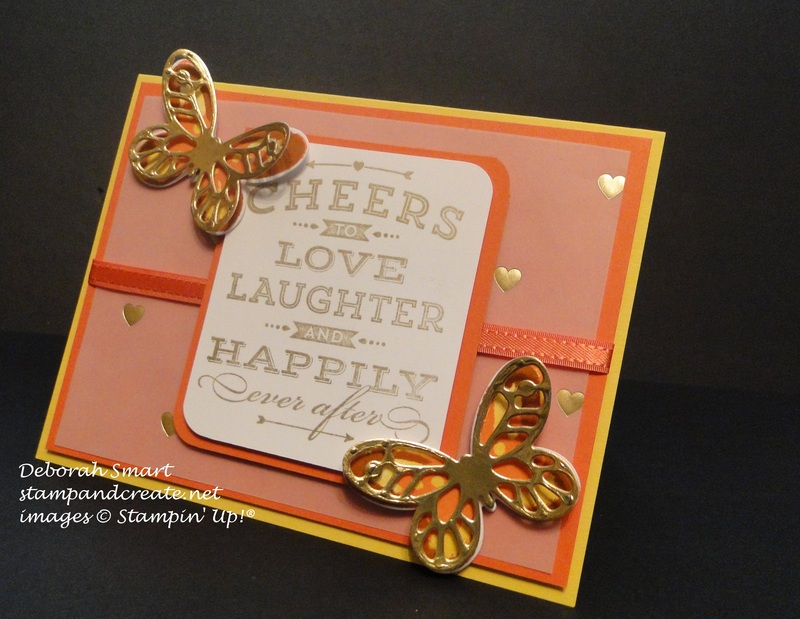 For our last card, we again used the retired Cheers to Love stamp set, and the new Watercolour Wings stamp set. This card is bright and cheery, just like the sentiment! Starting with a cardstock base of Daffodil Delight, then adding layers of Tangerine Tango and Fancy Foil Gold Vellum. 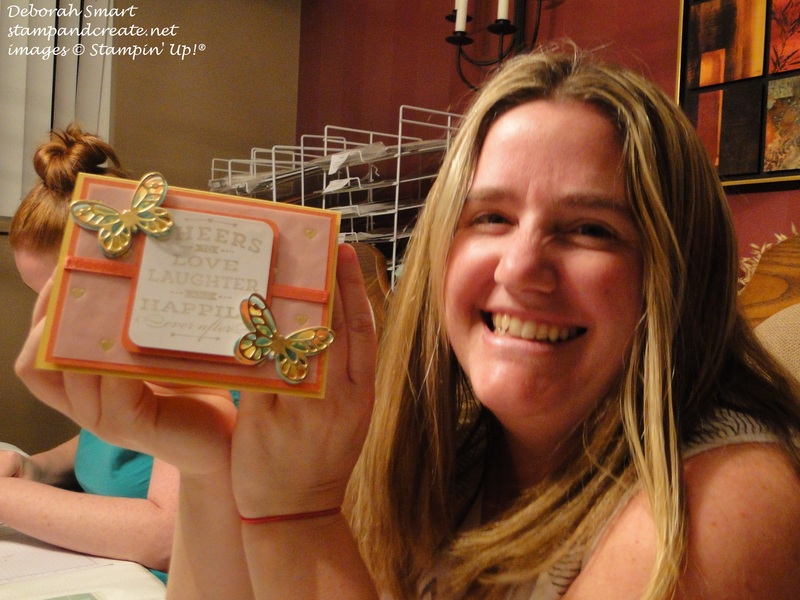 The sentiment was stamped in retired Gold ink, and layered onto a panel of Tangerine Tango. All were brought together with a strand of retired Tangerine Tango ribbon. The real show stealer of this card are the butterflies; the detailed top layer was cut from the gorgeous Gold Foil Sheets, using the new Bold Butterfly Framelits. The butterfly you can see peeking through was stamped using the fabulous new Watercolour Wings set; it’s a triple time stamping set that lets you layer and create your butterflies to be just like from Nature, or you can create your own colour combinations. We started with a base of Daffodil Yellow, then inside detail in Tangerine Tango, then edged in Cajun Craze. Gorgeous! (I’ll have a separate post all about this stamp set another time). Debbie knew who she wanted to give this card to, so she customized her butterflies to coordinate with the bride’s wedding colours! She stayed with the Daffodil Yellow and Tangerine Tango, but also pulled in Tempting Turquoise. I think the result is beautiful – what do you think? Have a look! I hope you had some fun seeing what we created – we sure had fun doing the creating! I hope this will inspire you to head to your crafting table, and have some fun of your own! Of course you’re always welcome to join us at our next class – just check out my calendar for all the details. We’d love to see you! Previous Previous post: PP248 – Paper Players Theme Challenge!